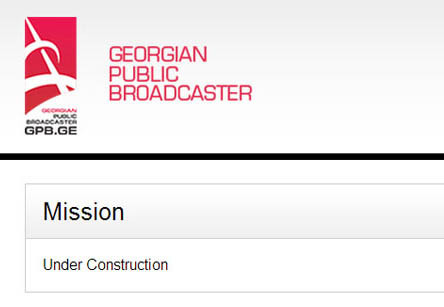 The questions whether or not the Georgian Public Broadcaster’s (GPB) board should be fully replaced and how the public broadcaster’s independence can be improved and protected in the future are at the center of a debate about changes to broadcasting legislation. A draft law that is currently discussed in Parliament, if passed, would result in the sacking of the GPB’s current board and would likely trigger the reorganization of the broadcaster’s top management. We recognize that the GPB has been underperforming in many aspects. The board has failed to exercise sufficient financial oversight; it has not been able to promote programming that would send a clear message that the GPB only serves the public and not political interests; and it has not ensured that staff is protected from undue outside influence. Thus, calls to replace the whole board are understandable. But we believe such a step by Parliament could set a dangerous precedent of new parliamentary majorities replacing the leadership of the GPB. What would stop the next government from doing the same, and to bring in people that are more receptive to requests and interventions by those political leaders? As a result of such a precedent, board members and executives of the GPB – and of other government entities that are supposed to be politically neutral – might perceive that their jobs are at stake when political majorities change, making them more vulnerable to political interventions. A recent analysis (conducted on behalf of the OSCE Freedom of the Media Representative) of proposed amendments to the law on broadcasting also hinted that a gradual replacement of board members under new appointment rules is preferable to a full replacement of the board. All board seats are filled through a competition to which any Georgian citizen can apply who has wide public trust, higher education and at least 5 years of work experience. In addition to existing conflict of interest rules, we suggest that people who have within the past year performed any paid work for any Georgian broadcaster, as well as individuals who have within the past 3 years been a member of a political party or have performed any paid work or service for a political party cannot participate in the process. The Speaker of the Parliament sets up a permanent parliamentary commission to pre-select candidates. This commission consists of one representative of each parliamentary fraction, including the chairman of the committee of education, science and culture who also acts as the commission’s chairman. This commission invites candidates to present their views and answer questions at a public hearing. In a public session, the commission selects at least three candidates for each vacant seat with a ⅔ majority. Parliament then votes separately on each of the shortlisted candidates. The candidate with the most votes, but no less than 50% of the vote, is appointed. Rather than being fully replaced, Parliament would select new board members as terms of current members run out over the coming months. Because the selection requires political compromise between different fractions of Parliament, we hope that it would produce a diverse board with members that are not controlled by or closely affiliated with any political group. Currently, two seats of the 15 member board are vacant. Four more members are finishing their terms by September 1, 2013. Thus, applying a gradual process would not undermine efforts to implement urgently needed reforms at the GPB.